In an age of busy working parents, results-driven school agendas and easily accessible technology, children often go for days each week with little physical activity. Add fast processed food, large portion sizes and lack of fresh produce to the mix, and we have a recipe for obesity and poor health in our children’s generation, and in generations to come. It is up to adults to provide opportunities for physical activity and improved nutrition if we are to reverse this unhealthy epidemic. 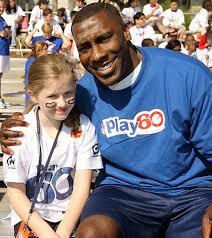 The American Heart Association has teamed up with the National Football League to create the PLAY 60 Challenge. The program aims to encourage children to get 60 minutes or more of moderate to vigorous physical activity daily, as recommended by the Centers for Disease Control and Prevention. Moderate activities should elevate the heart rate and engage large muscles throughout the body. Vigorous activities should be challenging, and should include running, jumping and other vigorous movements that raise the heart rate and elevate core body temperature. Children should engage in vigorous activity on at least three days per week, according to the CDC. Included in the CDCs recommendations are three hours of muscle building activity per week. Strong muscles promote good posture, elevate basal metabolism and prevent injury to joints. Muscle building activities can include resistance training, but weight training is not the only option. 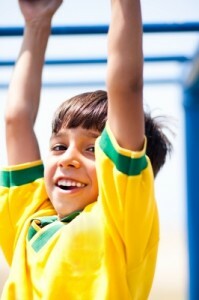 The use of playground equipment to climb, swing and hang can promote functional muscle strength. Body weight exercises like push-ups and pull-ups can strengthen the upper body and core muscles. Jumping, climbing and cycling can build strong leg muscles. The CDC suggests at least three hours per week of bone strengthening activity for children. Bones become stronger when subjected to weight-bearing activities. Exercises that strengthen muscles also impact bone strength. Running and jumping contribute to strong bones in the legs, pelvis and spine. 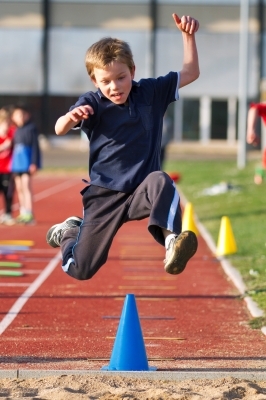 Climbing, striking, catching and throwing activities strengthen muscles and bones in the trunk and arms. 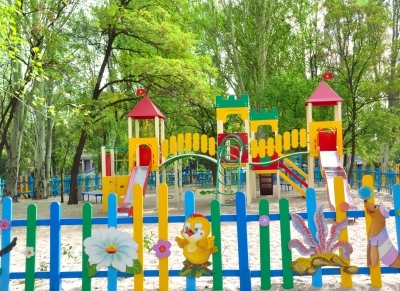 By providing opportunities and safe environments for active play, we can reverse the trend of childhood obesity that plagues our children and threatens the health of future generations. W.I.T.S. is on a mission to train leaders who are equipped to face the health challenges of today and tomorrow. As fitness professionals, we may be the ultimate solution to a plethora of health and wellness problems facing future generations. You can begin by honing your professional skills and knowledge through education. W.I.T.S. offers a number of courses that will give you the tools to tackle the tough issues. Check out our Youth Fitness Certification, Certified Personal Trainer and Lifestyle Fitness Coaching courses today. Bundle them as a subscription, and get them all for the price of one!